Waner was born in Harrah, Oklahoma. He (3,152) and his younger brother, Lloyd (2,459), hold the career record for hits by brothers (5,611), outpacing the three Alou brothers (5,094): Felipe (2,101), Matty (1,777) and Jesús (1,216), and the three DiMaggio brothers (4,853): Joe (2,214), Dom (1,680) and Vince (959), among others. For most of the period from 1927 to 1940, Paul patrolled right field at Forbes Field while Lloyd covered the ground next to him in center field. On September 15, 1938, the brothers hit back-to-back home runs against Cliff Melton of the New York Giants. Paul was known as "Big Poison" and Lloyd was known as "Little Poison." One story claims that their nicknames reflect a Brooklyn Dodgers fan's pronunciation of "Big Person" and "Little Person." In 1927, the season the brothers accumulated 460 hits, the fan is said to have remarked, "Them Waners! It's always the little poison on thoid (third) and the big poison on foist (first)!" But given that Lloyd was actually taller, this story would seem somewhat incongruous. 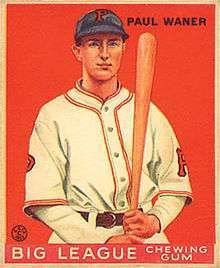 After playing the first 15 years of his career with the Pirates, Waner ended his career playing for the Dodgers (1941, 1943–1944), Boston Braves (1941–1942) and New York Yankees (1944–1945). Famous for his ability to hit while hung over, when Waner gave up drinking in 1938 at management's request, he hit only .280—the first of only two times that he failed to hit .300 as a Pirate. As Casey Stengel said in complimenting his base-running skills, "He had to be a very graceful player, because he could slide without breaking the bottle on his hip." Waner was also nearsighted, a fact that Pirate management only learned late in his career when he remarked that he had difficulty reading the ads posted on the outfield walls. Fitting him with glasses, however, only interfered with his hitting, as Waner now had to contend with a small spinning projectile rather than the fuzzy grapefruit-sized object he had been hitting before. Waner led the National League in batting on three occasions and accumulated over 3,000 hits during his 20-year baseball career. He collected 200 or more hits on eight occasions, was voted the NL's Most Valuable Player in 1927, and had a lifetime batting average of .333. He was elected into the Baseball Hall of Fame in 1952. He set the Major League record for consecutive games with an extra-base hit, with 14 (June 6 through June 20, 1927); since then this feat has also been accomplished by Chipper Jones in 2006. Waner died in Sarasota, Florida in 1965 at age 62. In 1999, he was ranked number 62 on The Sporting News' list of the 100 Greatest Baseball Players, and was nominated as a finalist for the Major League Baseball All-Century Team. Separate efforts by the Waner family and two longtime Pirates fans, who repeatedly petitioned Pirates then owner Kevin McClatchy to honor Waner by retiring his uniform number, were eventually successful. The Pirates retired Waner's No. 11 in a ceremony before their game vs. the Astros on July 21, 2007, the anniversary of Paul's 1952 Hall of Fame induction. A plaque has been placed in the interior of PNC Park to commemorate the retiring of Waner's jersey. ↑ "Today in Baseball". Washington Post. September 15, 2008. pp. E7.